Eye surgery is used to correct eye defects that cannot be corrected via alternative means. It is prescribed usually after other methods of treatment have been used to try correcting the eye defect. Some defects which are cured through eye surgery include myopia and hyperopia – near-sightedness and farsightedness and also cases like astigmatism. Eye surgery usually involves the removal of corneal tissues to correct these defects in the eye. What is Eye Correction Surgery? Almost every surgery that is done on the eye is a form of eye correction surgery. Eye problems are usually as a result of some defect in the eye and surgery is used to correct these defects and restore the eye to its more normal form. One of the earliest methods of eye correction surgery is what is known as Radial keratotomy, or RK. The early method of RK did not have a high success rate and left unpleasant side effects. It has since been developed and perfected to produce a higher success rate and is now a mainstream form of eye surgery. However, over the years, other methods have emerged. One which has seen a lot of popularity is the laser eye surgery. This involves the use of laser during an eye surgery to correct the defect in the eye. Regardless of the method that is employed, some form of complications might occur during the surgery, although this is a very rare occurrence. After the surgery, if not well looked after, infection could easily set in. But these are not complaints that are regularly heard and the most common complaint that is associated with laser eye surgery is what is known as itchy eye syndrome. This happens right after the surgery during the healing period and passes after a few weeks. Once surgery has been prescribed, an examination is scheduled to determine what form that surgery should take. Even though LASIK (Laser Assisted In Situ Keratomileusis) is fairly routine, there are certain patients which might not be suitable for that form of surgery. An instance is where the cornea is already too thin, another form such as LASEK (Laser Assisted Sub Epithelial Keratomileusis) might be recommended. After this, some other tests would be conducted such as a refractive error test and a test for the presence of glaucoma, amongst others. All these are to help in finding out just what sort of corrective eye surgery would be suitable for the patient. When the relevant examinations and tests have been taken and the suitable eye surgery determined, the surgery takes place. If it is a form of laser surgery, particularly LASIK, the whole surgery from preparation to the time to go home takes less than an hour. The surgery itself is a 20 minute procedure and scheduled as an outpatient one. 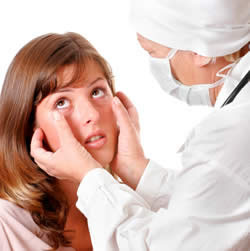 For LASIK surgeries, an anaesthetic is placed in the eye before surgery. During the surgery, an incision is made in the cornea so that the lower cornea layer is exposed and the laser is then used to correct the defect. Afterward, care of the eye is essential and involves the use of antibiotic drops. The cost of eye correction surgery will depend on what defect is to be addressed and what method will be used. RK is rather obsolete now so what you will get will most likely be LASIK or LASEK. The costs of these fall within the region of £400 to £2000, with LASIK being generally a bit higher. The NHS does not generally cover this type of eye surgery unless it is one which would lead to blindness or loss of vision without the surgery. If a pair of glasses or contacts can solve the problem, the NHS will not cover the cost.